Back in February, Viaje Founder Andre Farkas was a guest on our Stogie Geeks show and made the announcement of the Viaje Trifecta. 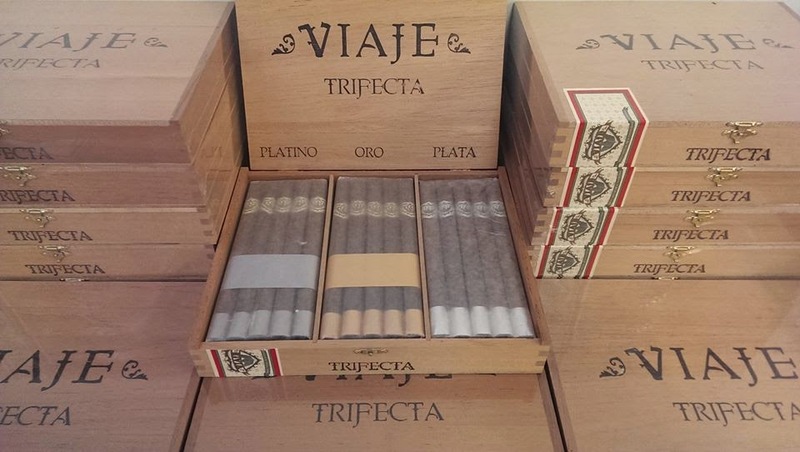 The Viaje Trifecta has been a lancero project that has been in the works for sometime. The Trifecta is a box of thirty cigars with three different blends (ten lanceros per blend). The blends will consist of the Viaje Platino, Viaje Oro, and a new blend called the Viaje Plata. Information on this announcement was made on Farkas’ Facebook page. As mentioned, the Trifecta has been a project in the works for sometimes. The project had been postponed due to a delay with the Plata blend. Farkas reiterated what he told us on Stogie Geeks that the Oro and Platino blends have been aging for over three years while the Platino was aging for the past six months. For the Oro, this marks the first lancero frontmark for that blend. Each of the lanceros in the Trifecta measure 7 1/2 x 40. In a piece of new news, Farkas announced that the Plata was rolled in Miami – the first Viaje Cigar to be rolled in Miami. The Oro and Platino blends are still being made out of Honduras. Farkas said in the comments of the Facebook page that he expects the Trifecta to ship this week (at press time).